Google Analytics is a great marketing tool, no doubt about that. Countless organizations around the world use the free version on their websites. But the truth is… many companies don’t use Google Analytics very well. Especially smaller organizations that have limited time and resources to put into it. Many businesses spend significant resources on their websites but then don’t leverage their visitor traffic and behavior metrics to help optimize marketing decisions, investments, and business results. They unknowingly lose new prospects and revenue opportunities. They overspend on bad marketing campaigns and tactics. They miss the key insights that lead to better marketing ROI and business performance. If so, my Google Analytics consulting experience will help you turn this situation around. And even if you’re already comfortable with the basics of Google Analytics and website metrics, I can help you take it to the next level for even better and more useful marketing insights. Through my iBeam consulting projects, I’ve provided Google Analytics services to clients in many industries. I’ve performed Google Analytics audits and fixed faulty setups, implemented best practices, and developed custom Google Analytics reports and analyses containing practical guidance for optimizing marketing spend and ROI. I’ve helped iBeam clients identify poorly performing marketing campaigns as well as those that deserve budget increases. I’ll help you identify and track the important metrics and goal conversions that matter to your company’s revenues and profits. I also provide personalized, hands-on training for individuals or small marketing teams, tailored to your specific business needs using your actual website analytics data. This can include Google Search Console training too, for website health checks and improved SEO analysis. We can hold analytics training sessions at your facility and/or conduct training remotely via web conference sessions to save time and cost. For corporate marketing team members who want Google Analytics certification for professional development, I can help you prepare for and pass the Google Analytics Individual Qualification (GAIQ) exam. I’ve successfully completed the core courses offered by the Google Analytics Academy and have passed the GAIQ certification exam with high scores multiple times. I know what it takes to earn a Google Analytics certificate… and can help you and your team pass the GAIQ test too. 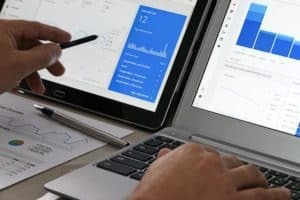 While you’re thinking about Google Analytics support needs, be sure to take advantage of these two opportunities as well: Free Google Analytics tools and a shot at winning free Google Analytics audit services. Digital analytics data is just a mass of numbers if you don’t unlock the available insights to make meaningful improvements to your website, apps, and marketing campaigns. iBeam adds value not only by providing direct Google Analytics consulting help. I also support clients on the metrics interpretation and follow-on marketing improvements that result from these insights. iBeam’s follow-on support activities can involve your inbound marketing and content marketing programs, SEO improvements, WordPress website improvements, digital marketing campaigns, and other areas. If you’re looking for a Google Analytics consultant in southeast Michigan, including Ann Arbor and Metro Detroit, let’s meet over coffee or other suitable beverage to discuss your project.